Souvenir building maker Microcosm’s produced a replica of the Griffith Observatory building in the 1990’s. It measures 2 inches tall and 5.5 inches long. The real Griffith Observatory sits on the south-facing slope of Mount Hollywood in L.A.'s Griffith Park and commands a view of the Los Angeles Basin. The observatory is a popular tourist attraction that features an extensive array of space and science-related displays.The land on which the observatory stands was donated to the City of Los Angeles by Col. Griffith J. Griffith in 1896. In his will, Griffith donated funds to build an observatory, exhibit hall and planetarium. Construction began in 1933 using a design developed by architect John C. Austin based on preliminary sketches by Russell W. Porter. The observatory and accompanying exhibits opened to the public in1935. In its first five days of operation, the observatory logged more than 13,000 visitors. The observatory closed in 2002 for renovation and a major expansion of exhibit space, restored the building, as well as replaced the aging planetarium dome. The building was expanded underground with completely new exhibits space, a café, gift shop and the new Leonard Nimoy Event Horizon Theater. One wall inside the building is covered with the largest astronomically accurate image ever constructed (152 feet long by 20 feet (6.1 m) high), called "The Big Picture", depicting the Virgo Cluster of galaxies. Since the observatory opened in 1935, admission has been free, in accordance with Griffith's will. The building has appeared in several movies including The Terminator, The Rocketeer and Transformers and, most famously, was featured in a number of scenes in the James Dean film Rebel Without a Cause. A bust of James Dean was subsequently placed at the west side of the grounds to honor the young actor. Check out this virtual tour of the building and grounds. 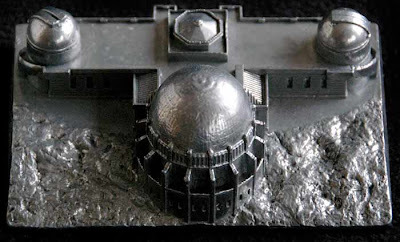 Does anyone know where I can buy a little model of the Griffith Observatory like this one?